Perhaps one of the most disturbing statistics in the food world today is the fast decline of the bee population. Bees are responsible for the flourishing of so many of our fruits and vegetables. Imagine being without apple-walnut rainbow chard salad, watermelon salad, pumpkin custard, or all the meals made with onions. Bees are responsible for pollenating the plants that provide ingredients for all these dishes. Without bees, we are essentially up a creek without a paddle. 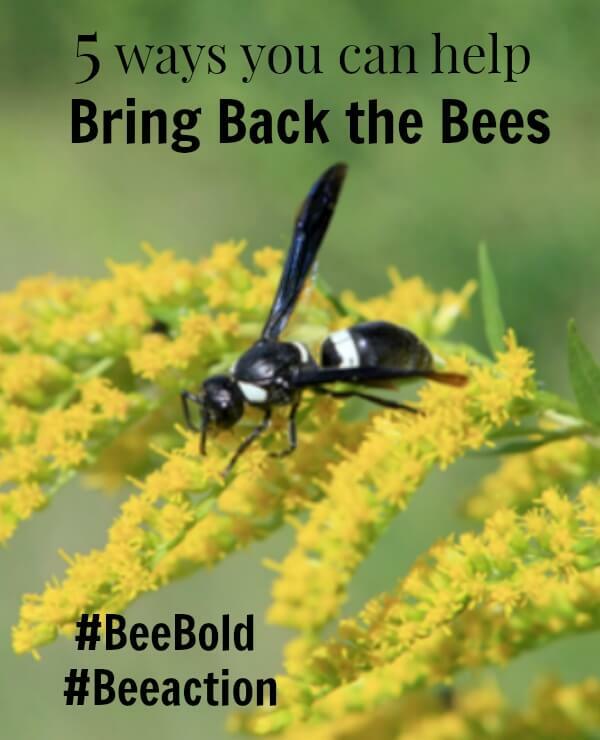 It is so important that we do what we can to bring back the bees. This post shows us how. “Bees and other pollinators play a critical role when it comes to our food supply. From pumpkins to onions to apples to almonds, bees help keep us fed. Yet bees continue to suffer incredible losses. While pollinators include butterflies, bats, hummingbirds and others, bees are the star pollinators. Bees are responsible for one in three bites of food. The estimated value of their contribution to the United States farm economy is more than 20 billion dollars! The problem is that our bee population is shrinking. Since 2006, the bee population has declined by roughly one-third every year. This phenomenon, known as Colony Collapse Disorder (CCD), has been linked, in part, to a class of pesticide known as neonicotinoids. Neonics are a nerve poison and the effects of exposure range from instant and lethal to chronic. Even long term exposure at low (non-lethal) levels can be harmful. Chronic damage can include: impaired sense of smell or memory; reduced fecundity; altered feeding behaviour and reduced food intake including reduced foraging in bees; altered tunneling behaviour in earthworms; difficulty in flight and increased susceptibility to disease. President Obama announced the formation of a Task Force in June of 2014 to assess the impact of neonicotinoids. He gave the Task Force 180 days. In May of 2015, the White House released its National Pollinator Health Strategy which failed to restrict the current use of neonicotinoids. This is indeed grievous. The European Union announced in 2014 that it will phase out neonicotinoids by 2016. The chief of the United States national refuge system, James Kurth, has ordered all GMO and neonicotinoids banned from wildlife refuges by January 2016. Can our nation afford to wait? Thanks to activist groups like Friends of the Earth each one of us can be involved in restoring the bee population. Their Bee Action Campaign offers practical ways to take action on behalf of bees – and ourselves. Andrea Fabry a former journalist and mother of nine, with a passion to help others take charge of their health. Her family suffered a severe toxic exposure that forced her to make radical changes to their diet and overall lifestyle. She love to help others do the same! Potter wasps are predators, not pollinators.